Lying is a normal part of human communication and is sometimes necessary to protect someone’s feelings, but there are also malicious lies meant to deceive, cheat, and defraud. You can’t always rely on what comes out of someone’s mouth. 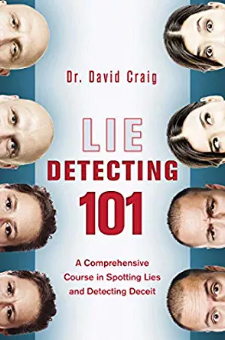 It doesn’t take mind reading superpowers to be able to tell when someone is lying—but it does take special skills and a little practice.In Lie Detecting 101, international expert in undercover operations Dr. David Craig provides readers with an easy-to-follow guide on applying lie-detection skills to your everyday life. From the simple skills of bargaining, making a purchase, or dealing with children, to the more serious business of negotiating a contract or identifying infidelity, Craig delivers simple but effective tips and techniques we can all use to see behind the façade and get to the truth.Lie Detecting 101 is the culmination of over twenty years of practical criminology and hundreds of hours of academic research. Split into three parts, the book looks at understanding lies and how to detect lies, and includes an easy reference section that summarizes all the main points. With full-color photographs and practical examples, Lie Detecting 101 provides anyone with the tools to be a human lie detector. The mystery of what a person is really thinking is finally unlocked in this fascinating and informative book.